Conspicuously trotting over the short mown golf course green at Brooklands (east Worthing) the Great Spotted Cuckoo, Clamator glandarius, seemed unaware of its audience of birdwatchers. Under an overcast sky with a Strong Breeze (Force 6) blowing off the sea from the south-east, the cuckoo could be seen clearly out in the open where it seemed to be pecking at the ground (more like a Pied Wagtail than a Starling) for food. The Great Spotted Cuckoo spends the winter in Africa and flies north to southern Europe (including Turkey and Spain) to find a bird's (usually a corvid's, especially Magpies') nest to lay a single clandestine egg for the surrogate parent bird to incubate and feed. It is a rare vagrant to southern England with only 39 records in Britain and Ireland up to the end of 1995. One of those was at Shoreham Airport before in 1990. 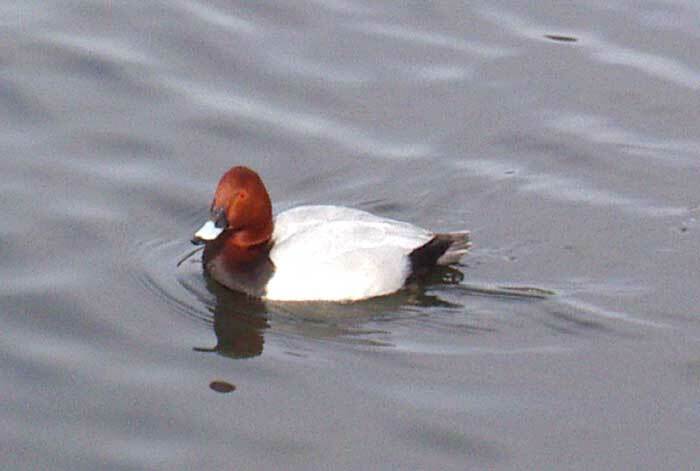 There was just one Pochard seen amongst the usual Mallards andCoots. The twenty or so Pochards were tucking their beaks into their body. 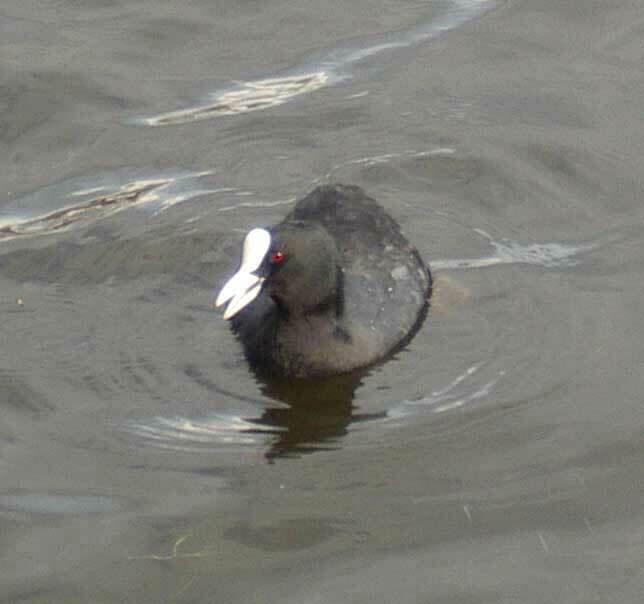 There were as many and probably more Coots on the lake, plus the occasional Moorhen. There were two Dunnocks amongst the reeds at the edge of the lake and Pochards amongst the Coots and gulls. 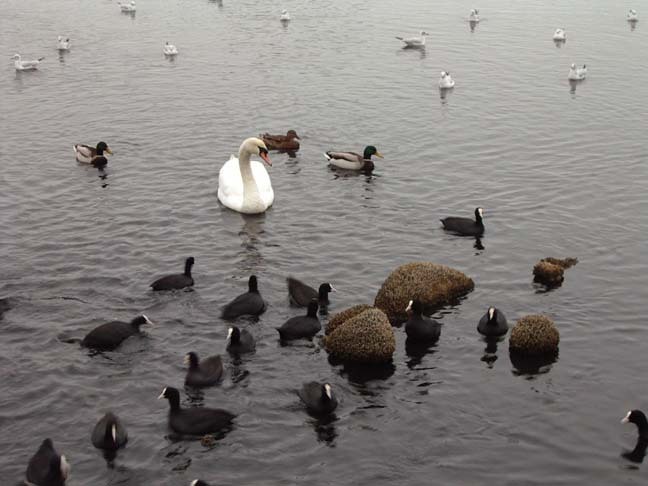 Four Tufted Duck are seen on Brooklands Boating Lake with twenty Pochards. Tufted Ducks are carnivorous, feeding on insects and small invertebrates, whereas Pochards are vegetarian. On Brooklands Boating Lake there were half a dozen or so Pochards, and at the southern end there was a congregation of about thirty Coots and a dozen or so Moorhens. It was here that I spotted a colourful yellow Grey Wagtail on the sluice gates. 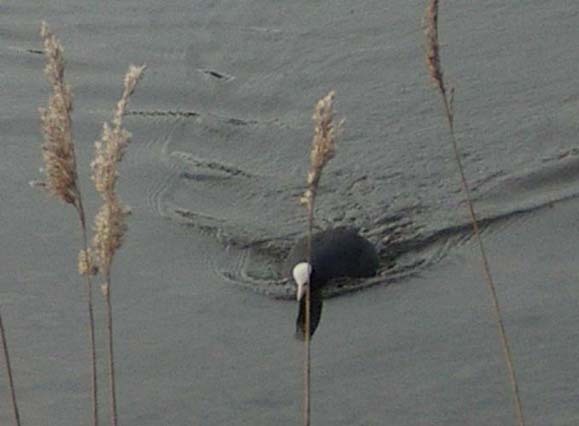 I visited Brooklands Lagoon, Worthing this afternoon. I was busy watching a winter passage Little Gull, when five more tumbled out of the sky settled on the lake and started to actively feed. They were all adults. Also Firecrest, Kingfisher and Grey Wagtail. A few of the more interesting birds had been reported from Brooklands recently, but I expect this from from the early risers, as in the mid-afternoon, there were just 30+ of the usual Coots or a fully flooded lake and a few Moorhens. The first Emperor Dragonfly of 2004 was spotted majestically flying up and the down the Teville Stream that feeds into Brooklands Boating Lake over the reed-bordered stream open to the public. It had a a very bright pale blue abdomen and looked fresh in the sunshine. The boating lake was noted for the return of the commoner birds with about 30 Coots and a handful of Moorhens as well. At the southern end in a shallow area near the weir, small shoals of Ten-spined Sticklebacks and freshwater water beetles including the Water Boatmen were noted. A Common Darter Dragonfly flew over the lake. Booklands Boating Lake in flood but there was a paucity of birds, just a pair of Mallards were seen in the main area of the lake. Below the weir the main part of Brooklands boating lake looked slightly a milky white colour. I did not see any of the usual Moorhens and Coots and there were just a handful of gulls on the surface of the water in the centre, which did not seem to be discoloured. 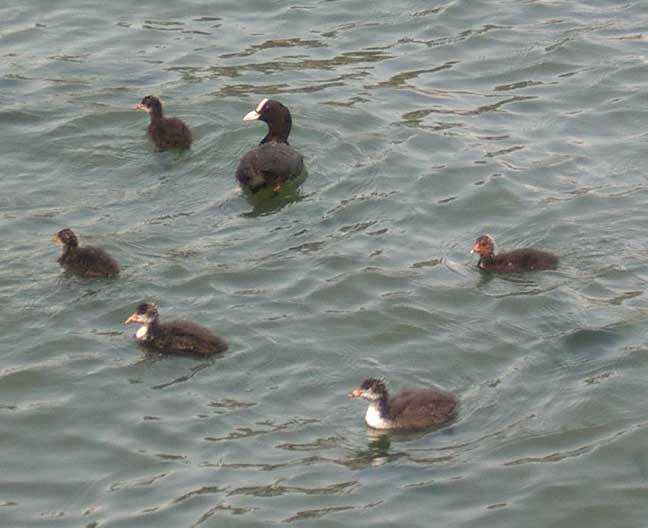 The Moorhen chicks followed the white bread that was fed them accompanied by a Coot and no sign of the parent Moorhens although a Mallard was also at the feeding station on the main part of the lake but just south of the weir and bridge, by the miniature railway station. There were relatively few birds on the lake, which was now back into full flood after some maintenance work. Nine cute Mallard chicks swam after their parents, the drake and the hen Mallard. Brooklands Boating Lake has been drained again and there is lots of mud exposed. The freshwater stream that feeds the brackish water lake was pouring over the weir in a continuous flow. In living memory the whole area was a marsh with allotments called the Brooks. It has been drained and landscaped to be enjoyed by the public, but it may have been a bit too sanitised to appeal to some shyer species of birds. 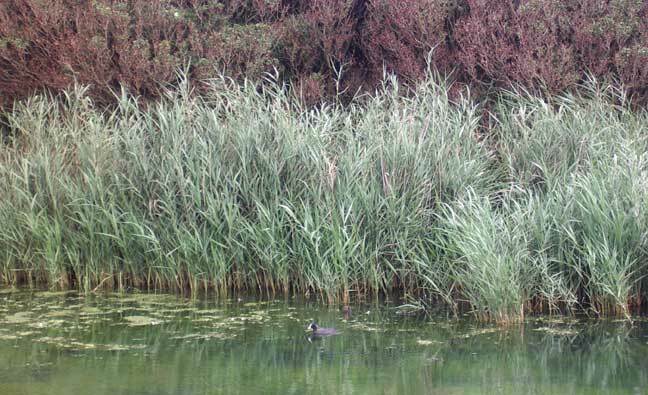 A strange worm was noticed for the first time growing on the stems of reeds and on solid objects in Brooklands Boating Lake. It has not been seen in Brooklands since the lake was created. It was first spotted this summer from the seaward southern end and spread all over the lake but not to the full freshwater reaches called the Teville Stream. This is the feeder stream from the north. The small holes which look like the skeleton of a microscopic animal have an external diameter of up to 1 mm and an internal diameter of up to 0.8 mm. 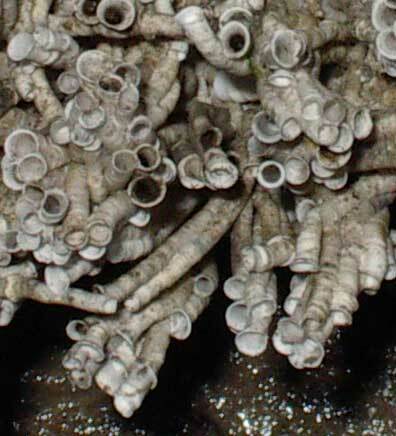 Each tube is from between about 10 mm to 25 mm in length. 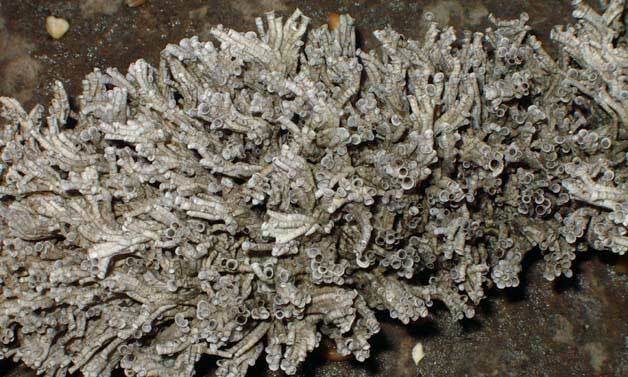 At the time of writing I have not identified the animal which could be a worm or a bryozoan? 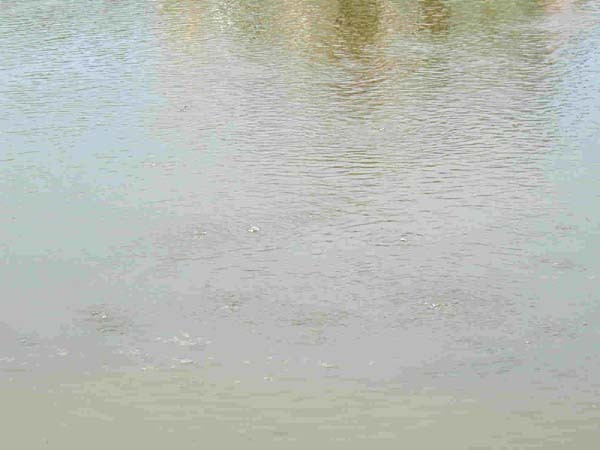 The reasonable speculation was that it has been able to become established this year because of increased salinity in the low brackish water lagoon, because of the profound lack of rainfall this year. There are sluice gates separating the lake from the sea, and the juvenile stages may have arrived with a seawater intake. The worm tubes are omnipresent on all the hard substrates and reed stems in brackish lake below the weir. In the freshwater reaches above the weir, the worm tubes are present but only in small amounts. (Investigation of 28 November 2003). It does seem that the weir only functions when the water level is reduced and for most of this summer the lagoon water level is above the level of the weir. The mystery organisms are the empty tubes of the serpullid worm, Ficopomatus enigmaticus. "A southern species often termed Mercierella, that extends northwards to the southern North Sea. 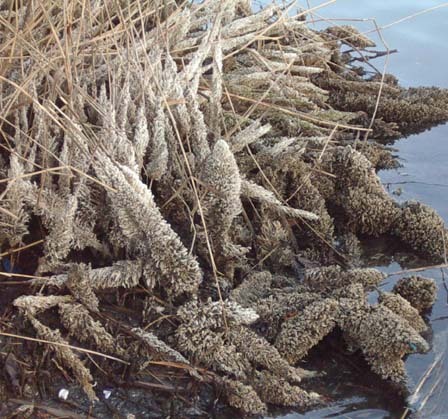 It will construct its c. 1 mm diameter, up to 30 mm long tubes on most substrata, natural and artificial, including the stems of Common Reed, Phragmites, and is particularly characteristic of harbours, docks, artificial lagoons and power-station outfalls with salinities of from 35 down to 10 ppt (and exceptionally, in fresh water); it has also been recorded from several natural lagoons. The tubes, which possess circular, shelf-life platforms near their mouths, are often aggregated into large colonies." tube often looks as a series of trumpets. This worm disappears after cold winters, demonstrating its subtropical origin. Brooklands Boating Lake (east Worthing on the Lancing border) has been partially drained of water so that repairs to the wooden supports of the embankment can be carried out. A Little Egret visited the lake for the first time, perhaps appreciating the lowered water levels. The is also an authentic report of a pair of Canadian Geese paying a brief visit to the muddy lake. Summer seems to be over with hailstones, a chilly south-easterly breeze (Force 4) and a perpetually grey overcast sky with rain showers. 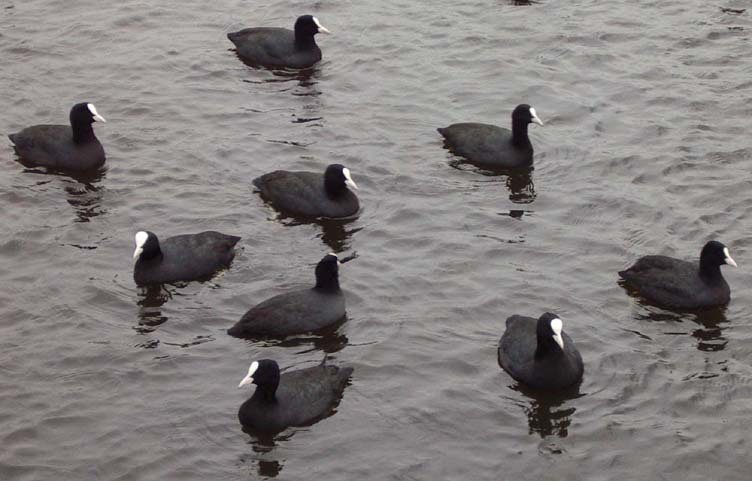 On Brooklands Boating Lake (east Worthing on the Lancing border), there were about 80 Coots, over a dozen Mallard, two Mute Swans, one Pochard and one Moorhen. On the beach sand a score or more of Black-backed Gulls rested and there were at least three Redshanks feeding in the Widewater shallows at the eastern end of the lagoon. On and around Brooklands Boating Lake (east Worthing on the Lancing border), there were two Kingfishers, two Grey Wagtails and four Goldcrest. The chill northerly breeze felt like winter for the first time since February, and the temperature was only 8.5 ºC at 5:00 pm. Brooklands Boating Lake (see the entry below) could not be hypertrophic (overnutrified, cf. eutrophic) because in the upper stream reaches a shoal of about 30 Rudd could be seen in the clear slightly cloudy water, with broken bits of algae, but no aquatic plants, although there was some marginal waterside vegetation. These silvery fish were attractive with their bright red fins. There were the usual plentiful 50+ Coots on the main body of the lake, but I only spotted one Moorhen in the upper reaches. The Shoreham Herald reports that Brooklands Boating Lake is again closed because of the mysterious deaths of both resident and visiting birds including six Mute Swan cygnets, two Coots, nine ducks and one gull. The cause is till unknown. A toxic blue-green algae and botulism have been suspected as well as polluted silt in the lagoon. 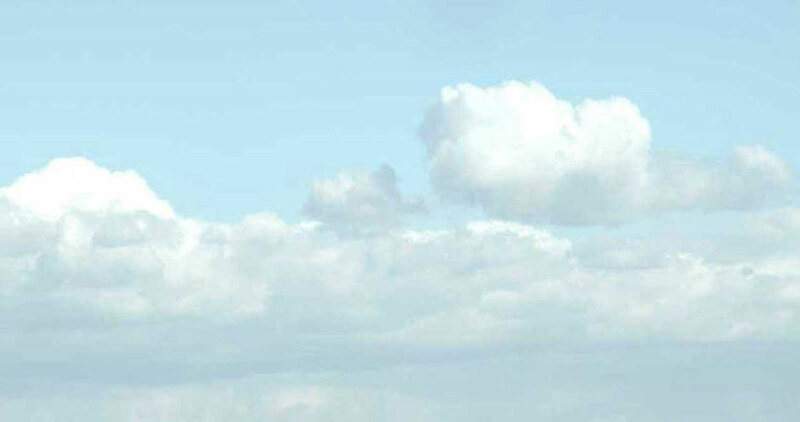 The smelly problem occurs in late summer when the temperatures are at their warmest. The water in Brooklands is mostly fresh stream-fed water, and is shallow without any appreciable water plants. The blue-green algal toxins can be harmful to humans and pets, and can be transmitted by pet dogs. 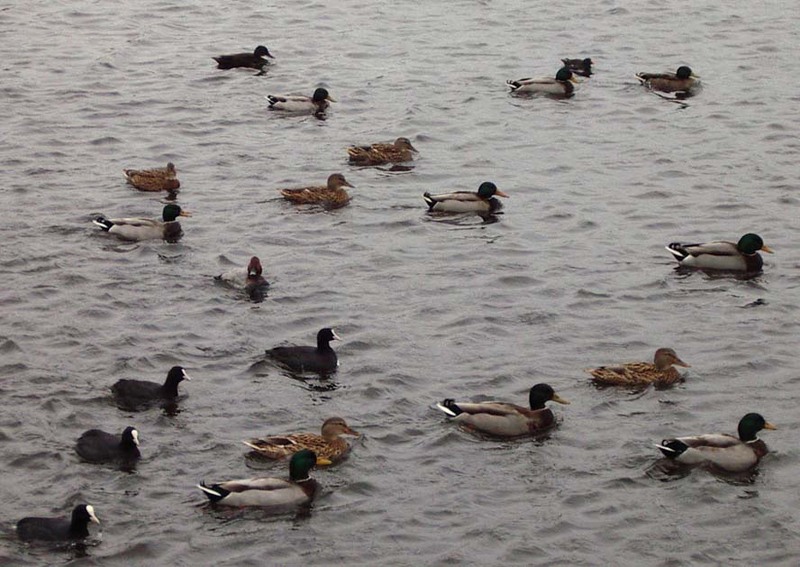 Death in waterfowl can be rapid with the species of algae that produce neurotoxins (including anatoxins). 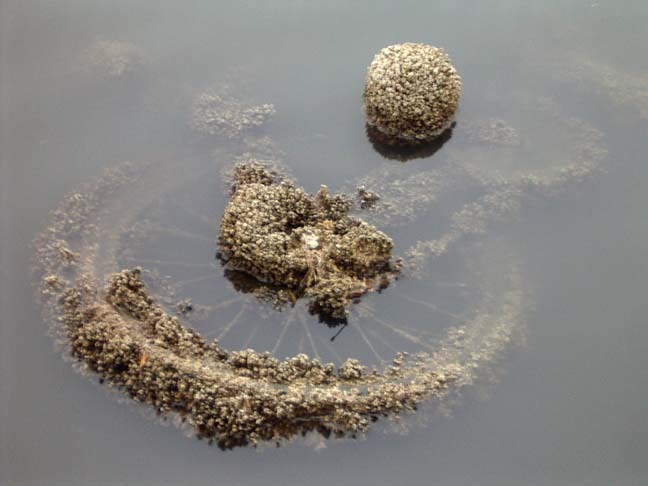 There are various different blooms of algae, all of which are encouraged by eutrophic water conditions. 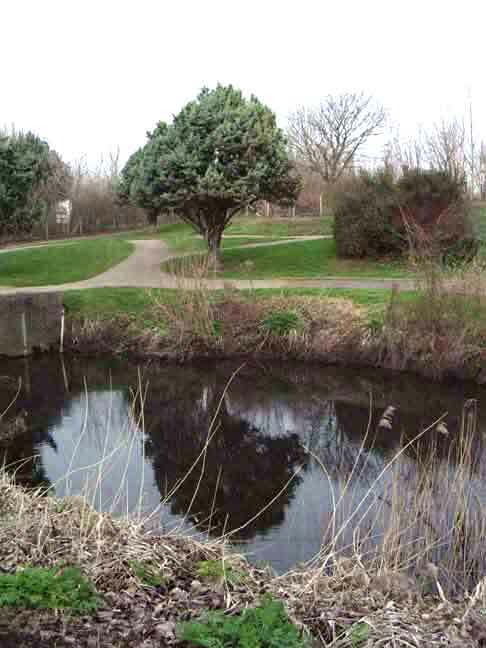 Botulism has also be found to be the cause of fatal disease in ducks in British town parks. On a misty drizzly day the Ruddy Shelduck sheltered in the lee of the island on Brookland's Boating Lake, with over fifty Coots, a couple of Moorhens and a small flock of about a dozen Pochards which could be seen reasonably close up (with 10 x 25 binoculars) with their attractive maroon head (male only). The very few reports from Brooklands prior to year 2003 have not been included on these pages yet.